Dice the DULCINEA™ PureHeart Seedless Watermelon into cubes, 1/2” x 1/2”, and place in large bowl. Slice the Kumato® brand Tomatoes in half and slice each half into eight wedges. Add to bowl. Trim the celery leaves and attached stem to 2”, and add to the bowl. Add the mango, and the salad greens to the bowl, and toss to mix. Add dill in three additions, tossing after each addition. Pour the oil into a small bowl and add the balsamic glaze, whisking to emulsify. Stir in coriander, salt and pepper. Taste and adjust seasonings. 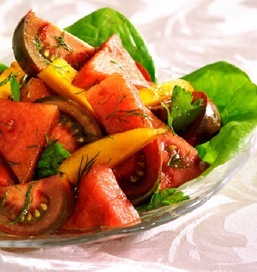 Gently toss 3/4 of the dressing with the Watermelon Tomato Salad, taste and add remaining dressing if needed. Line a luncheon size plate with large lettuce leaf if desired. Scoop a portion of the salad onto the lettuce and serve. Place a stem of fresh dill over the top of each salad before serving if desired. *Balsamic glaze is balsamic vinegar that has been reduced to a thick and syrupy glaze. You can prepare your own glaze by gently simmering 3 cups of balsamic vinegar down to a thick syrup. The consistency is correct when the syrup coats the handle of a wooden spoon.